I think that maybe, every Friday, I will review my week at work and pick one thing that has happened to write about. So... This week I could write about all the baby boy clothes that seem to have been shoplifted, sigh, or about our new Peter Rabbit clothing delivery. But no, I think I'll write The Tale of the Elephant Comforters. One evening during the week I received an online order for a couple of Moulin Roty elephant comforters from a customer in the US. Along with the order was an email pleading for speedy delivery - her little girl had lost her favourite comforter and simply couldn't sleep without him. I emailed right back and assured her I would send them out by airmail the very next day, but overnight I received another email saying to hang fire and that she would call me at noon the next day to discuss other, faster options. The next day. Noon arrived and the lady's husband telephoned to say that a FedEx priority collection had been arranged and to expect a courier within an hour. Less than five minutes later - yes, five minutes - and in walked a friendly but brisk FedEx agent, armed with paperwork, packaging and an impressive understanding of the situation. She informed me that the parcel would be on a plane by 5pm and delivered to the little girl the very next day. I signed a few forms, handed over the elephants and off she went with a great sense of urgency. I half expected her to break into a run. Well, I didn't hear anymore so I am assuming that the elephants made it to their destination on time and that the little girl has been reunited with her favourite toy, but the whole thing has made quite an impression on me. From the parents so keen for a quick delivery that they were quite prepared to spend well over £50 in the process, to the most outstanding delivery service I think I have ever encountered. Less than 24 hours door to door from Pershore, Worcestershire to Savannah, Georgia. Not bad. Especially when compared to the usual experience - vague delivery times, disinterested depot managers, no guarantees and parcels disappearing into the ether for days at a time - and that's just the 30 miles over to Hereford. 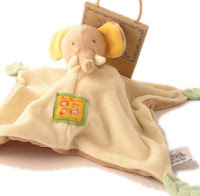 So, well done FedEx, thank you to my elephant comforter customers, and a message for mum and dads everywhere - if your little one has a toy that they just cannot live without, get a back up! Your 'Elephant Comforter' story is so fantastic, I almost feel as if I were there! Hi Charlotte, What a wonderful story! The elephant comforter is adorable from the pix. Makes me want to order one myself... I'm glad you chose to focus on the positive! You blog is beautifully designed, btw.